Repair, reuse and recycle… the exhortation of modern ‘eco sustainability’. Doing this is sometimes a faff, sometimes time consuming, sometimes daft because the next version is so much better performance. But it’s also satisfying to rescue a favourite piece of kit and prolong its performance life, even if only for a short period. 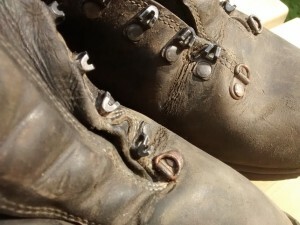 In this case my boots were leaking, they had been resoled once and the leather was cracking. 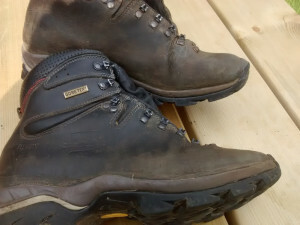 There was a hole in the tongue and the repairer had left a narrow band of leather just above the new sole which was buffed to ensure good bonding, leaving a place for water ingress. The leather wetted out very badly when I went for even a short walk. Uuuumhm, do I want wet feet for a 2 week crossing of Scotland? Should I buy a new pair? No time to go through the long process of finding a good fit and then trying out. 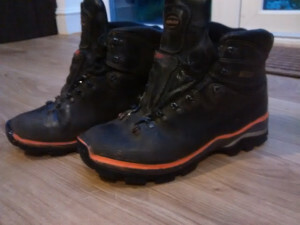 OK boots don’t need breaking in nowadays but they do need checking out with footbeds and socks and so on. Here is is what I did. Inserted SUGRU along the sole line to effect a better seal, hopefully. Applied Shoogoo into the leather cracks and hole in tongue and after 48hours applied 6 coatings of Nikwax wax boot proofing creme. Finally bought new pair of shoelaces and waterproofed them with Grangers Extreme Repel, the stuff that Greenpeace don’t like because its got C8 in it. Do they leak? Watch this space. Hopefully there won’t be a ‘distress purchase’ along the route in Aviemore.